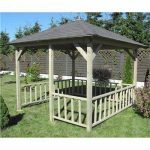 This is a high quality gazebo that is of a considerable size. At the same time it is not overly expensive, and has some good features. Chief among these is the frame, which is powder coated steel, and offers a lot of protection against rust and erosion. A high value, low price item. 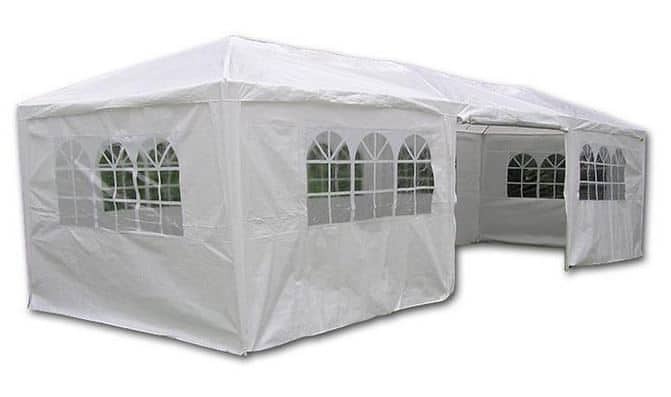 This is a marquee designed to help you entertain guests. It measures up at 883.92 cm wide and is 304.8 cm in depth. It has a generous height of 250 cm. The unit has white polyester as it’s main material. This material is not only found in the walls, but also in the roof. 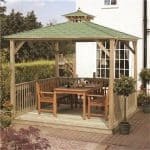 The white polyester provides a suitably tough protection against the rain, which makes the gazebo an ideal choice for unpredictable climates. It looks good too. 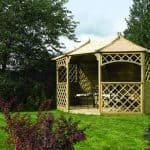 And this means that you have an attractive gazebo that has plenty of potential for housing guests even if it is lashing it down with rain. There is an excellent level of stability here. The frame is steel that has been specially powder coated. This means you have a steel that is naturally resistant against rust. 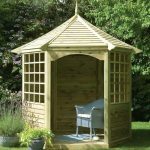 This makes a huge difference because, try as you might, it is not always practical to disassemble a gazebo so that you can store it overnight. It is for this reason that a gazebo is left out, and sometimes this means rain gets to it. However, rather than rain proving to be a problem and promoting rust, the steel powder coated framework, which is incredibly tough too, really works hard to keep the structure rust and erosion free. And we found that the framework was robust enough to make us feel secure in the rather windy conditions we tested it in. That powder coating goes on to provide plenty of value, as it removes the need for treatment. You can look forward to many years of erosion-free service. Every good marquee has plenty of windows, and this one is no slouch in that regard. We found it incredibly good value for money with eight side walls, each of which had windows in them. 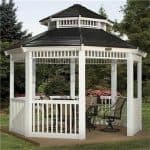 This brings a good amount of light into the gazebo internal area, which means that you can easily use it for a relaxing garden party on a summer’s afternoon while providing shelter at the same time. There are no customisation options. Final Thoughts: We think this is an excellent gazebo. It has a great aspect in that there are plenty of windows in the walls, letting in ample light. We also liked the fact that the steel is protected against rust and erosion through the powder coating. 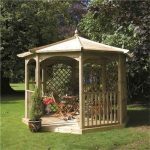 It all adds up to a functional and attractive gazebo, which is a bargain at the price on size alone.